Hundreds of Afghan and coalition soldiers reclaimed one town from the Taliban and moved on a second Tuesday, following an outburst of violence that has forced thousands of residents to flee their homes, the U.S. military and aid officials said. A top Afghan security official accused Pakistani Islamist groups of helping the Taliban fighters chase police from the two towns in the south, where thousands of U.S., British, Canadian and Afghan soldiers are battling the worst surge in Taliban violence since the 2001 toppling of the hard-line regime. Local lawmakers pleaded with Afghan President Hamid Karzai to do more to stop insurgents crossing the porous border with Pakistan. The aid group International Organization for Migration reported about 4,000 Afghans have fled the violence in Helmand province, where the two towns were taken by the Taliban. The militants long have operated freely in their former strongholds in the southern provinces. But their ability to capture towns highlighted the weakness of Afghanistan's police forces in remote areas, and the challenge faced by international forces in restoring order in the country. On Monday, a band of insurgents overran Naway-i-Barakzayi and burned the town's police compound, a clinic and a school before leaving, said Helmand's deputy governor, Amir Mohammed Akhunzada. Afghan and coalition forces retook the town Tuesday and unfurled the Afghan flag over the charred compound, Akhunzada said. The troops moved on toward Garmser, a town of more than 50,000 on the Helmand River, where the Taliban on Sunday defeated 40 poorly armed policemen who had been holed up in a concrete compound for more than two weeks. The U.S. military said Tuesday that coalition and Afghan forces had "experienced only limited small arms and rocket-propelled grenade fire" as they headed to Garmser. Deputy Interior Minister Abdul Malik Sidiqi accused Pakistan-based Islamic groups Lashkar-e-Tayyaba  which is suspected of a role in last week's Bombay, India train bombings  and Jamiat Ulema-e-Islam, a pro-Taliban political party, of aiding the Garmser takeover. Afghan officials accuse Pakistan of not doing enough to stop militants entering their country through the 1,470-mile border. Pakistan says it is doing all it can to crush insurgents and has deployed 90,000 troops along the frontier. In the eastern Pakistani city of Lahore, Jamiat spokesman Riaz Durrani dismissed Afghan claims that his group's members were involved in the Helmand fighting. "We are not helping any militant group in Afghanistan against (President) Hamid Karzai's government, but the fact is that he has failed to restore order," Durrani told The Associated Press. A Lashkar-e-Tayyaba spokesman could not immediately be reached for comment. Helmand, one of Afghanistan's most volatile regions, is dotted with small villages and towns linked by long, remote highways that provide ideal ambush sites for militants. About 4,000 British troops, part of an expansion of NATO forces into the region, are deploying there at the end of the month to take over from U.S. forces. Suspected Taliban extremists killed two Afghan policemen in an execution-style shooting and wounded another in southeastern Ghazni province, police said. Militants fired rocket-propelled grenades at an eastern Afghan girl's school Monday but caused no casualties, the U.S. military said. 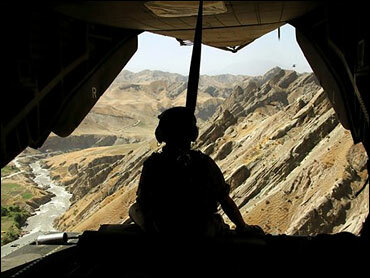 The U.S. military said a homemade bomb exploded accidentally Sunday in southeastern Afghanistan, killing one militant and wounding three.